ot having a roof with all the rain we’ve had the last two weeks has not been easy. The farmer who said he’d take all the hay out of the loft before the roofing project has disappeared into thin air. Leaving me to tarp the hay in an attempt to keep it dry and free of nails and shingles during this process, in hopes of finding someone else who wants it. 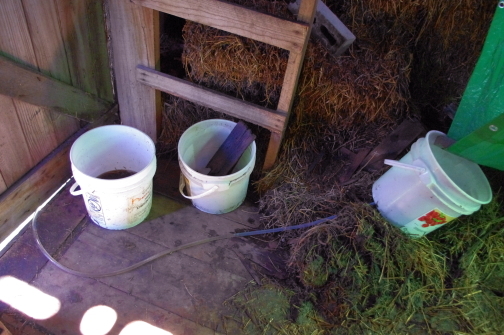 We arranged bales into a gully shape, strung up tarps and tapped a bucket with a syphon, to try to coral the rain. It has been a bit of a nightmare. If you know anyone who has a use for OLD alfalfa bales please email me at meyerfarmproject@gmail.com. They were stacked tightly and kept dry, so many are still relatively green.